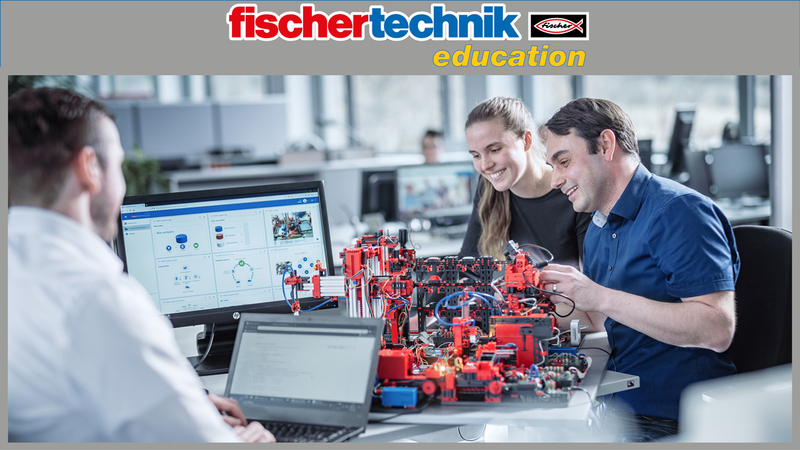 The fischertechnik learning environment is used for learning and understanding industry 4.0 applications in vocational schools and training as well as for research, teaching and development at universities, in companies and IT departments. The simulation depicts the ordering process, the production process and the delivery process in digitised and networked process steps. 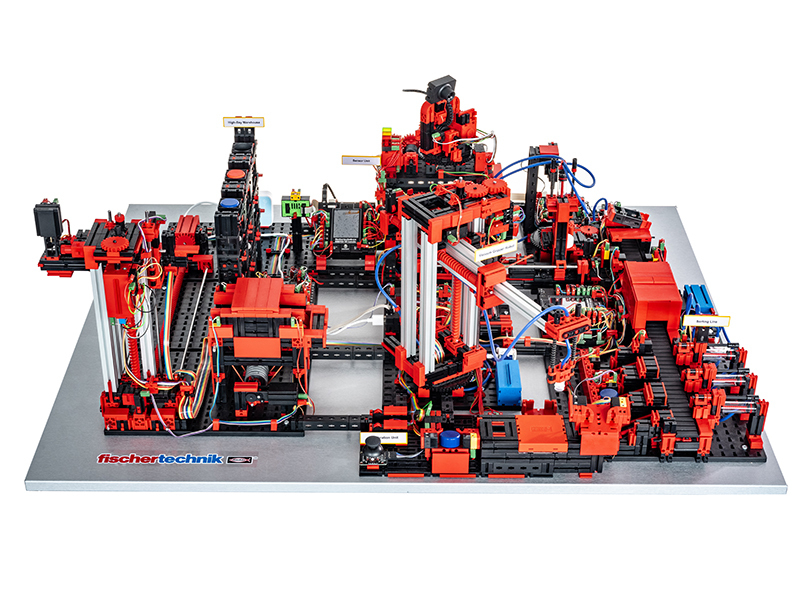 This consists of the factory modules like storage and retrieval stations, vacuum suction pads, high-bay warehouse, multi-processing station with kiln, a sorting section with colour detection, an environmental sensor and a pivoting camera. After the order has been placed in the dashboard, the workpieces pass through the respective factory modules and the current status is immediately visible on the dashboard.The integrated environmental sensor reports values for temperature, humidity, air pressure and air quality. 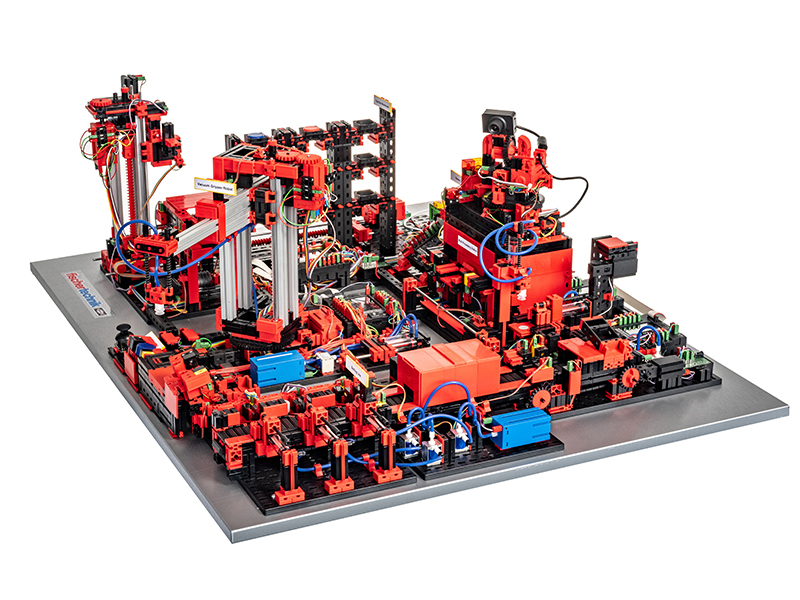 The camera sees the entire system through the vertical and horizontal pan range and can thus be used for web-based remote maintenance.Individual workpieces are tracked using NFC (Near Field Communication): A unique identification number (ID) is assigned to each workpiece. This enables traceability and visibility of the current status of the workpieces in the machining process. USB Host port: USB-A port for fischertechnik USB camera, USB sticks, etc . Programming possible with ROBO Pro, C-Compiler, PC-Library, etc . The software application is written in C/C++ and is loaded on the controller in the ready-to-start status. The corresponding C/C++ library and the API are published on Github: https://github.com/fischertechnik. This library can be used to write customised C/C++ programs for the learning factory. 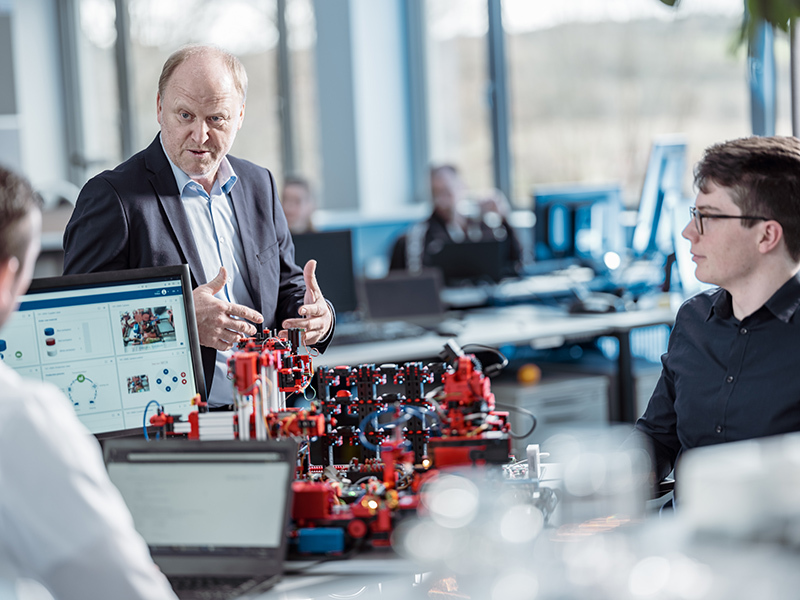 The connection to the fischertechnik cloud is established via the WiFi router supplied and integrated into the learning factory. We recommend using the web browsers such as Chrome or Firefox. The cloud can be used via a personal access that is created once (www.fischertechnik-cloud.com). The cloud servers are located in Germany and ensure that strict European requirements regarding the storage of data are applicable. Personal data is protected in an account with password access that uses extremely secure "OAuth2" industry standard. All data sent to the cloud is transmitted encrypted with certificates (https standard, green lock in web browser). The customer view shows a webshop interface with a shopping cart, where you can order a workpiece and track the current status of the order in the shopping cart. This process is displayed on the interface for the customer so that he/she is informed about the status of his/her order. The process of ordering the raw material is displayed and visualised in the supplier view. The factory status, the production process, the stock, the NFC/RFID reader and the sensor values can be queried in the production view. In addition, the camera that monitors the production line can also be controlled here. All these functions are controlled within a window and actuated via the menu. In Factory status, the status of the respective module is visualised via a traffic light display. 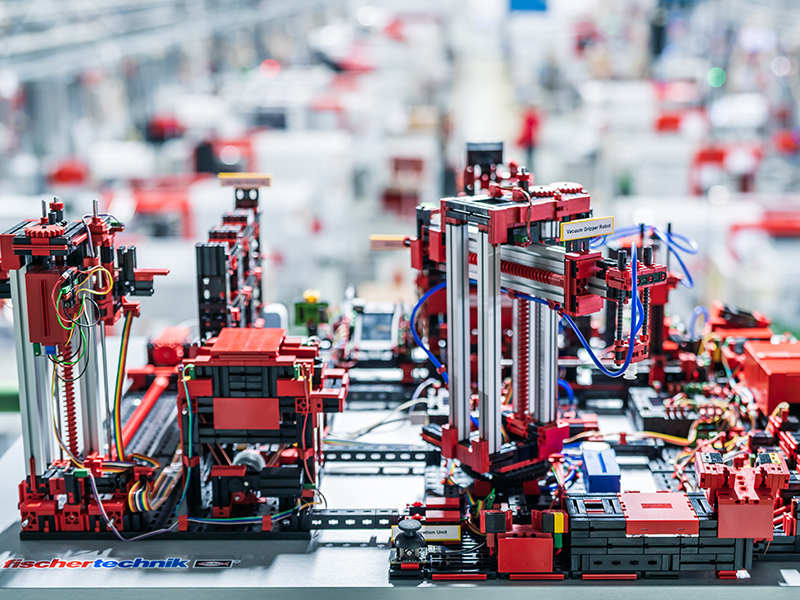 If a fault occurs in production, it is acknowledged via a button after the cause has been rectified and production is continued.The individual manufacturing steps are visually simplified using connected nodes and represented in the Production process view. The currently active node (= production module) lights up green or red when the respective process step is being processed live or there is an error and is waiting to be corrected. The Inventory production view visualises the current inventory of workpieces including minimum and maximum stock. A reorder point procedure is stored. This production view is used exclusively for visualisation.The production view of the NFC/RFID reader displays the workpiece data and can be used to read or delete workpieces manually. The raw data of the NFC tags can be read using a standard NFC app from mobile devices with NFC readers. Each workpiece has its own unique ID and displays the following data: Status, colour and timestamp from delivery to dispatch.The camera is also controlled via the production view and the read values of the environment sensor can also be viewed here. The teaching material will be available soon.